After reporting a loss, Mazda forecast more red ink ahead. Dollar figures are in millions. Note: Fiscal years end March 31. Results converted at the March 31 rate of $1= ¥97.29. TOKYO -- Tumbling sales in North America dragged Mazda Motor Corp. to a full-year operating loss, and the company warned that worse results will follow in the wake of the global market meltdown. 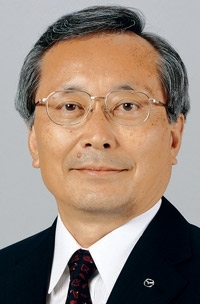 Mazda reported an operating loss of ¥28.38 billion, or $291.7 million at current exchange rates, in the fiscal year that ended March 31, President Takashi Yamanouchi said last week. That compared with an operating profit of $1.67 billion a year earlier. Sales in North America, which accounts for more than a quarter of Mazda's global volume, slid 14.4 percent to 347,000 vehicles in the past fiscal year. Mazda sees business there falling an additional 6.5 percent to 290,000 this year even though the company expects the market to regain some traction in the fiscal second half, from September through March 2010. Mazda is the latest Japanese automaker booking losses on slumping sales and unfavorable exchange rates. Yamanouchi said those trends will continue, widening Mazda's operating loss to $513.9 million in the fiscal year that began April 1. "We will continue to suffer bad news," he said. In the fiscal year just ended, Mazda's worldwide sales fell 7.5 percent to 1.2 million cars and trucks. Still, the improvement won't be enough to offset an expected $616.7 million operating loss in the first half.